Please consider a donation to help establish the Mary Silver Ocean Sciences Award for student research and travel. We plan to raise at least $25,000 to create an endowment in Mary's name that will provide annual funds for Graduate Program support. 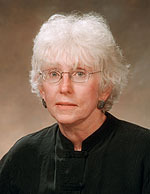 Mary Silver, professor emerita, received many awards and honors in recognition of her accomplishments, including the Mary Sears Woman Pioneer in Oceanography Award in 2002 and the Henry Bryant Bigelow Award in Oceanography in 1992, both given by the Woods Hole Oceanographic Institution. She received her bachelor's degree in zoology from UC Berkeley and her Ph.D. in oceanography from the Scripps Institution of Oceanography at UC San Diego. Silver joined the UCSC faculty in 1972. Her research focused on harmful algal blooms caused by toxin-producing marine phytoplankton. Silver's pioneering studies of "marine snow," which began in the 1970s, revealed the importance of the small nonliving particles that drift down through the water like snow. She showed that marine snow is a major source of sinking organic matter in the world's oceans and is the site of intense microbial activity. To make a contribution, go to the UCSC Giving Site, enter the amount of your gift and, under "Other area/Pledge number," enter "Mary Silver Ocean Sciences Award." For more information on this award, please call or email Marcus Frost at (831) 459-5238, jmfrost@ucsc.edu. To make any contributions, please go to the UCSC Giving Site. Please include a note indicating that your gift is supporting the Ocean Sciences Department.